A 6.2-magnitude earthquake hit Central Italy on 24th August 2016. This project develops is response to post-earthquake reconstruction strategies. In this unusual site – a plain fragment of seashore along the Adriatic coast – a few architectural elements define a permeable space. Here, mirror-like elements, evoking the twofold meaning of the word “reflection”, characterise a playful space with which both lecturers and audience can engage. Our cities are the result of a continuous process of negotiation between material contingencies and the spiritual dimension of the community that inhabits them. When a natural event as an earthquake scars our urban and domestic environment in irreversible ways, what is left is ourselves and the cultural baggage resulting from our past experiences. This immaterial resources represents the first resource to be used in the process of reconstruction. This considerations inspired the proposal presented for this project. A large symmetrical space has been thought to be delimited, along the long sides, by wooden septum covered by a mirror-like membrane. 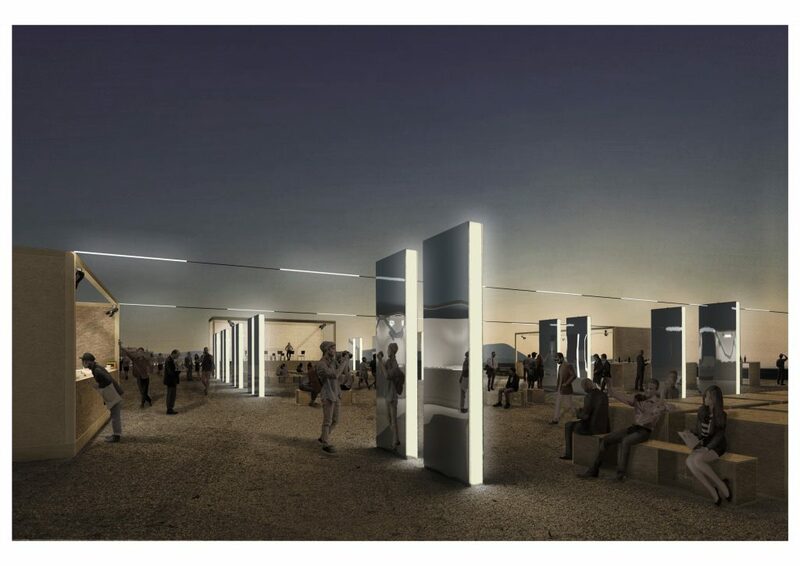 These vertical elements frame the attendees of the event, as main protagonists of the debate on the reconstruction that has been host in this temporary installation. Each of the attendees seeing his/her image mirrored on the septum will be encour- aged to reflect on his/her role as member of a community and as citizen in charge for the physical and spiritual reconstruction of our damaged territory. What prompted you to take part in the competition? Within this framework the context and the natural elements which constitute it, become the first architectural pieces of the design. Nature and its features need to be highlighted by the architectural elements. How and to what extend did you challenge and explore the brief ? In 2017 (when we participated to the competition) the brief was more demanding than ever. In addition to a site that needed to be interpreted spatially, we were asked to think about the role of architects and architecture in post-earthquake scenarios. 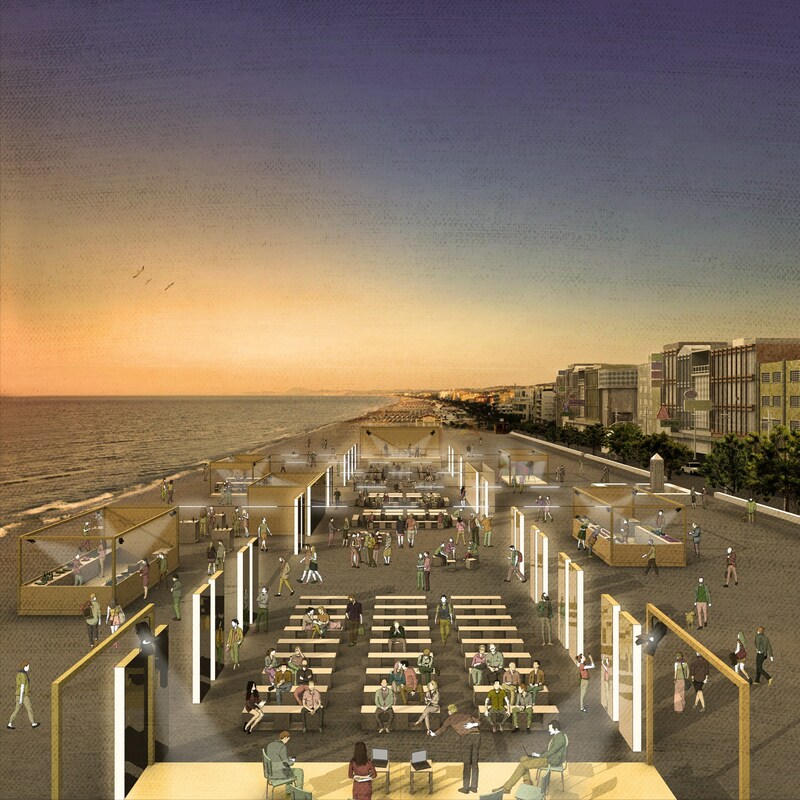 On the 24th of August 2016 a 6.2-magnitude earthquake hit Central Italy and the theme of the installation had to be“communities’ reconstruction” as an essential precondition for a physical reconstruction of theterritory. Through the use of a limited amount of elements we challenged the brief by creating a space that took advantage of the characteristics of the site while introducing something completely new. 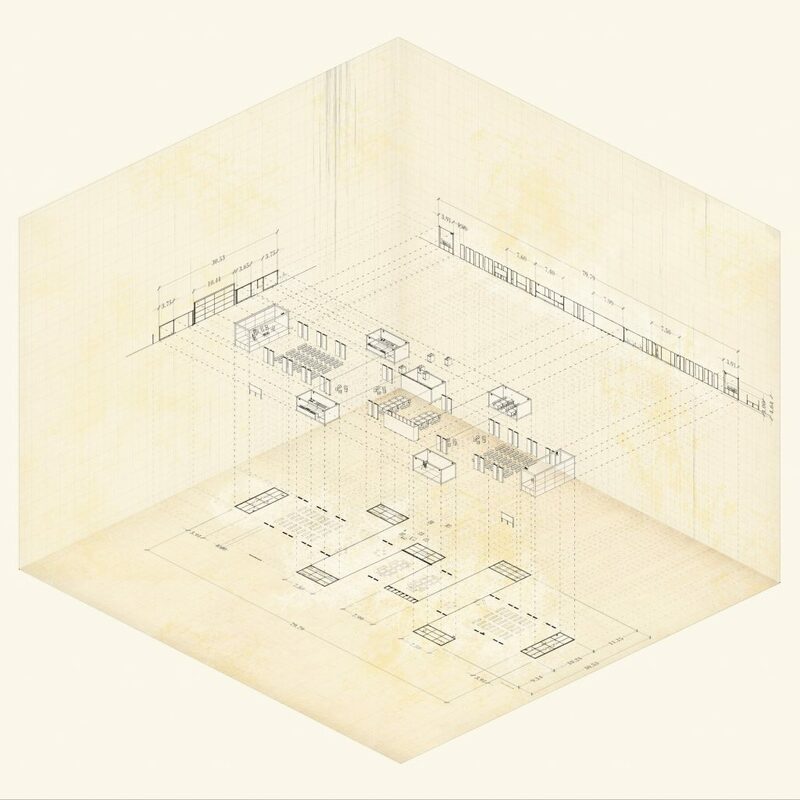 We designed a clearly defined, open space whose elements looked at each other and were reflected in a continuous game of echoes and reverberations that engaged with both attendees and lecturers. What were for you the driving factors through which you develop your proposal? We developed our design as a result of a very simple concept “to reflect” and its two fold meaning. Through the use of mirrors, the installation focused all the attention towards the community. The mirrors framed the attendees of the event as main protagonists of the debate on the reconstruction that was being hosted in this temporary installation. Each of the attendees, when seeing his/ her image reflected in the panels, was encouraged to reflect on his/her role, as member of a community and as citizen, in charge for the physical and spiritual reconstruction of our damaged territory. What defined the articulation through the GIF? We thought that a GIF would have been the best way to describe the project due to the temporal dimension which gave us the possibility to provide, in a five-seconds time span, insights on construction techniques, on-site operations sequence and lighting design through the day. How important was it to reveal your overall strategy? A good control over all the aspects and phases of the project was essential to produce this dynamic graphics and we think that this awareness sticks out quite clearly from the GIF. As previously mentioned it is a way of representing a project that puts together several aspect of the design and of the construction process. The GIF let us create this virtual bridge between design concept, constructions methodologies and spatial qualities of theproject. How important were the renders? Photorealism was necessary in order to convey an idea of what the final outcome could have been. The renders help us a lot as through the entire process as design instruments. We used renders to calibrate aspects of the project as density of the architectural elements and therefore permeability with the natural context or intensity of thelighting. What is your take on this visualisation technique? Photorealistic representation in architecture is an essential tool as it allows one to foresee a reality that does not exist yet. It’s a method of representation which is extremely time consuming yet unavoidable. 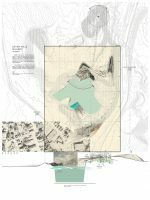 We, as architects, cannot escape this kind of visualisation as it represents the most immediate and effective instruments of communications with people that are not familiar with the traditional techniques of architectural representations (plans,sections,elevations…). Once built and inhabited what were the most interesting revelations? Once realised, the project was awesome and a lot bigger than what we expected! The reflective panels worked perfectly and created the space we wanted but the most surprising effect they brought was definitely the one of multiplication. Inside the central space, once it got inhabited, everything multiplied in an optical illusion in which everything seemed to be moving constantly. The space worked as an extension of the natural elements from which it seemed to be grown. 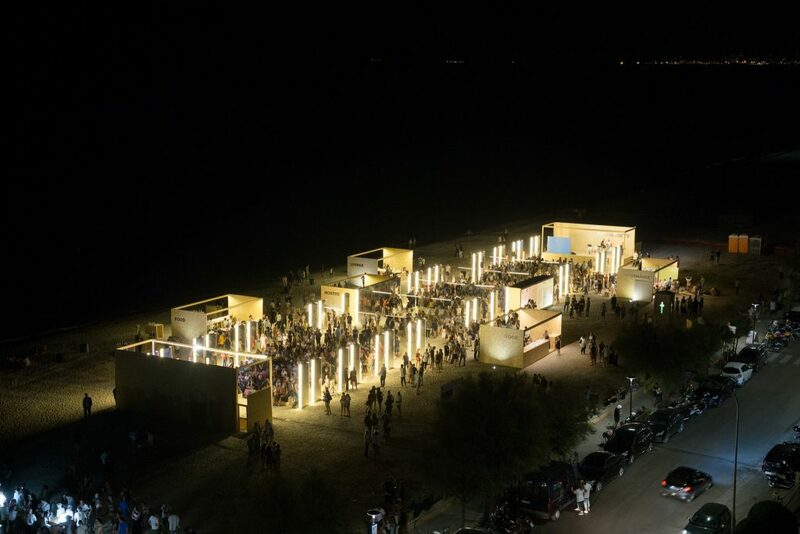 The light and the colours changed on the beach from the sun set to the night and the same happened on the surfaces of our installation, contrast and harmony got balanced by this continuous dialogue. People had a lot of fun!The space was extremely engaging and everybody was interacting with our mirrors in a way or another. The mirror defined the degree of permeability between the central space and surrounding context a people standing in front of the them projected this sequence on the entire space. People listened to,looked, talked, ate, relaxed in position that were very much related with the composition of the project. It was quite revealing to see how much the space can influence the human behaviour.